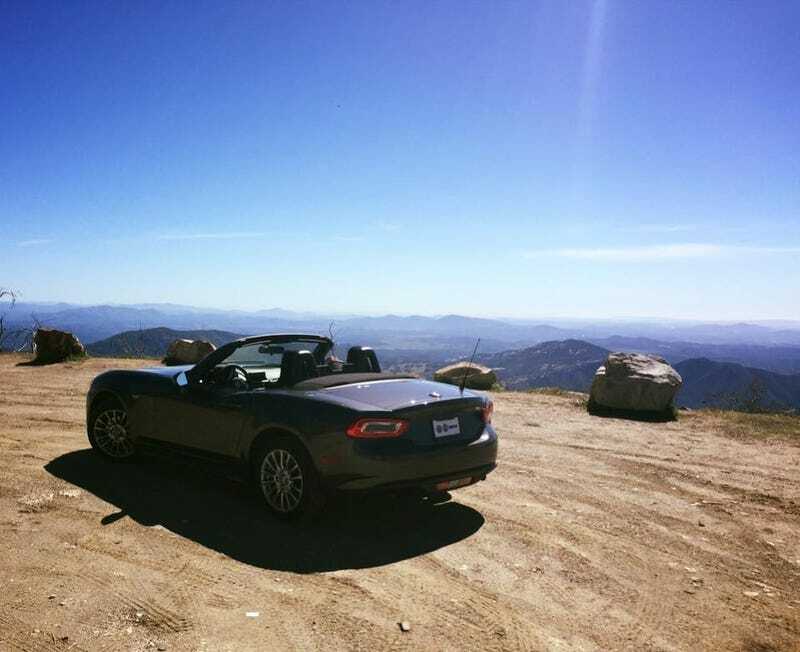 Well, this is a mini-review of my Fiat 124 Spider along with some nice pictures of a trip I took the other day. I’ll have a full review later when I can borrow a nicer camera, get some good pictures and finish typing it up. I’ve been meaning to get the full review done, I’ve just been busy or sick or both. Anyways, enjoy the mini-review. Nestled away just a little North-East of San Diego, at the far edges of North County, off the major freeways and away from the over-paced bustle of city life; is a beautiful charming mountain that few seem to know about - at least few outside of the enthusiast community. Palomar Mountain is a scenic drive, one which can be accessed by three different roads - East Grade, West Grade and South Grade. At the top of the mountain is a wonderful little observatory - a great treat to visit if you are a tourist; and a delightful little eatery called Mother’s Kitchen, home to some of the nicest staff and the best breakfast not directly on the coast. My choice of poison to try the Fiat out on first was South grade, with a planned trip down East Grade to overlook Lake Henshaw provided the car didn’t fling me into a ravine or off a cliff to my death. For those of you not from San Diego, here is what South Grade on Palomar Mountain looks like according to Google Maps. What Google doesn’t show is the little curves, bends or inclines; or just how tight some of these corners can be. Without having ever driven it on the touge in Japan, I presume this is the American equivalent or as close as I can get. Signs like these are what I live for, these are the roads I seek out and how I de-stress from the world. South Grade takes you from about a 1000’ elevation to a 6000’ elevation, all over 7 miles of twisty fun corners and beautiful scenery. Normally most people like to drive down South Grade on cruises or rallies, but I prefer to drive up instead. Luckily I went on a week day, and the road was almost completely empty except a single rental Versa that kindly let me pass on a “straight”-er part of South Grade. The weekend is unbearable though with motorcyclists flinging themselves down the Mountain in some twisted ritual to get themselves killed - either by flying off into a ravine or cutting corners wide into oncoming traffic. Starting off South Grade is a trick the mountain plays on you, with nice sloping corners that are predictable and able to be taken with some moderate speed, a great way to get a feel for your chassis before you push it onto the tighter higher passes. However, very quickly does South Grade become convoluted and tight, with many a sign warning you to stay under 10 mph, something the Fiat and I gladly ignored as we pushed upwards. Derived from the Mazda MX-5 chassis, the 124 is even moreso composed and agile on it’s feet for it has less body roll, and is much more controllable and predictable when the rear steps out. Every review and every journalist waxes on poetically about the MX-5, how great it’s chassis is, how it just rolls into the corners and sticks like its on rails. The 124 takes that beautiful chassis, massages it further and gives it a bit of Italian charm - the result is mind blowing and far more sophisticated than the standard MX-5. It feels tuned in almost perfectly, 9/10ths of the way to perfection at no additional expense over the Miata. It is one of the few experiences I’ve ever had in a car of that caliber outside of a Viper or 911, and honestly is quite on par with my previously owned modified Saturn Sky Redline. It is absolutely at home up in the mountains or out in the canyons, being pushed to the limit that the tires can take as it slides gracefully around the corners, with just enough confidence to tell you to push it a little more; and unlike it’s 4C brethren, it doesn’t lose you at the limit. It also has a grace unlike the MX-5, which can corner just as well, but leaves you uninspired with it’s massive body roll that makes you feel like you are in a kayak about to capsize. The true beauty of the 124 was just how intuitive it was to push it at it’s limits. While it required suitably attention and concentration, I was never completely focused on the road and only the road to where I couldn’t also absorb the second best part of the mountain: the views. Palomar Mountain has a few nice avocado and such farms at its base, and grows more densely forested the higher you climb. My pictures can not do this scenery justice, and it is the best place to get away from life in a packed city. For those that can recall a few years ago, California was hit by yet another round of mega-wildfires that ravished the state and caused many to lose their home. Palomar Mountain itself was hit in the last round, and only continued to suffer with the prolonged drought we found ourselves in until the recent rain. Although life has definitely found a way and is flourishing with the new water, remains of the past still find themselves nestled quietly in sight. I affectionately refer to these trees as the “ghosts” of Palomar Mountain, and feel they have their own beauty in the stark contrast of all the green. There aren’t a lot of spots along South Grade to pull over and grab a break or a quick photoshoot - nor would you want to with the wonderful curves blending into each other. The best part about stopping to take in the sights though, is getting going again. While I have a Classica trim level, with a massive resonator and muffler stuck onto the exhaust, under partial to full throttle you still get a nice burble and a slight growl with a decent tone. The Abarth has a much, much nicer exhaust - although the aftermarket gladly has you covered and is the route I plan on going, giving a even nicer sound than the Abarth trim. Of course, I can’t mention the exhaust without mentioning the engine, the same 1.4L inline 4 turbo that powers the 500 Abarth. While the specs don’t sound overly impressive given the current sports market, 1.4L making 160hp in a world now dominated by 5.0L, 6.4L and larger V8s making 400-707hp in pony cars to even “true” sports cars like the Cayman making 350hp out of a 2.0L; that isn’t to say the 124 is underpowered. With the light weight of the car, a mere 2300 lbs, and the distinctive charm of the 1.4L that has pushed enthusiasts to love the Abarth; at no point other than a hard launch does the 124 feel lacking in the grunt department. While there have been complaints of turbo lag in the mainstream reviews, as a owner with a little over 1000 miles in my short term of having the car, I haven’t noticed much if any turbo lag at all - at least compared to the fantastic 90s turbo cars I’ve owned in the past. Below 1800 rpm sure, there is no boost; but starting at 1800 rpm to 2300 rpm, you feel that “swell” of boost making its black magic work, and from there the engine pulls hard until 5000 rpm, when the turbo drops off and you’re asking a 1.4L to make top end power. I have found the sweet spot of the most linear, hard push of torque power is keeping the engine from 2500 rpm to 4000 rpm - a very happy spot it enjoys. Keeping it in that sweet spot between 2nd, 3rd and 4th gear made the trip an absolute delight that only pushed me down to 14 mpg for the trip, which is not terrible for me giving it a good 75% effort up and down the mountain. Come barreling out of 10 mph corner at 25, to a short straight away where you can open up the engine, move from 2nd to 3rd and then hit this longer sweeping corner somewhere in the middle of third - complete bliss. The perfect San Diego weather, mid eighties and sunny, only helped the experience with the top down and the hints of that crisp cool mountain air. Sadly, South Grade goes as fast as it comes, and with only a few spots to pull over I don’t have many photos to share, just a permanent grin left from a car excelling in its natural habit. In the Kappa world (Sky and Solstice), we welcome everyone to the “permagrin” club, because you’ll always be smiling - the 124 continues the legacy of the permagrin. At the top of South Grade you have a few choices: to the left is Mother’s Kitchen, a tourist trap gift shop and the observatory; straight across the intersection is a wannabe national park style parking lot and picnic area; while to the right is East Grade, Lake Henshaw and eventually the highway. Right it usually is, unless I want to grab a bite at Mother’s. Had to break it into two photos as it was too long to fit with any sort of detail into one. East Grade is far more relaxed than South Grade, encompassing 15 miles of long corners, beautiful vantage points and a slow descent from the Mountain. Beautiful vantage points do not disappoint on East Grade either, as the first turnout here shows. The mountains on the right hide North County and the bustle of life, while out to the right, if you look just blow the clouds you can see the Pacific Ocean. This photo really does not show the scale of distance, or the nice steep drop to the bottom a few feet away. It is just a place that needs to be experienced in person. A quick blast out of the vantage point towards the next just confirms to me that the 124 is really the perfect spiritual successor to the turbo Saturn Sky. The ease with which it builds speed, the way the seats hug you and hold you in place, the crisp fast but solid shifts and the balance of the car all work in your favor as you bang through the gears down hill. Its a nice place to be with the top down, hair in the wind and all that good stuff. You can talk about how great the MX-5 chassis is, how fun the Abarth engine is, how great the drivetrain choices over the ND are or how comfy the interior is - but there is one thing you can’t avoid talking about: the looks. The 124 strikes the right balance of modern and retro styling, while not coming off as identical to its Mazda counterpart. Sure, the double bubble might be silly since the modern 124 is a single cam; and yes, the Abarth’s massive black plastic looks awful in person. The basic Fiat though is nice, simple with clean lines and a timeless look. I suspect this will age far better than the ND and most origami styled cars of today, perhaps even looked fondly back on much how the original Spyder is nowadays. I could go on about the exterior, but much like the MX-5, you either like it or you don’t. I’ll let you make up your mind, you decide. Another few tight corners and another quick vantage point showing off something not seen much down South: endless green (with a few specters of the ghosts dotting the landscape). I was going to talk about how much fun it was going down this part of the mountain and was thinking of some great ways to write about it when I was driving - until I looked down at the gauges and saw my speedo. I was completely within the law, officer. You find yourself unexpectedly reaching nothing but plains of green and a hint of blue. There is a bird spotting vantage point that I always find myself stopping at when on Palomar. I usually find a spot on the curb by my car as I let her idle, cooling down after being pushed up South Grade and thrown down East Grade. None of my cars have ever had a heating issue on the mountain, but I do it as a courtesy anyways and it gives me an excuse to take in the view. Just, beautiful. It’s hard to describe the feeling of open-ness after being stuck in the city with endless gridlock traffic day to day. It’s refreshing, and the 124 is close to the most perfect way to take it in. A few others have just as much fun leaving the vantage point back down East Grade as I have, obviously. Sadly though, from this point out it’s even wider corners (which can be taken with more speed, although at this point I was just cruising), and then an eventual merge back onto a two-lane highway. Still as beautiful as the rest of the mountain, but nowhere as technical as South Grade. Right before the highway merge is a full pull-off point, giving you a moment to debate whether you want to go left to grab some BBQ at Round-up or continue on further into the mountains; or if you want to go right and head back to North County. Of course after all the effort of driving out I had to stop for some delicious BBQ, but unfortunately my phone died at this point and I didn’t have a charging cable in my car. All in, the 124 Spider in Classica is something that no longer exists anymore, at least not much longer. No frills, no unnecessary luxuries - just simplicity. Door handles you pull to open the door after pushing a button on a fob, a lever instead of a sector that forces you to physically change the gears, large simple gauges that only tell you want you need to know - how fast your spinning, how fast the engine is spinning, how much dino juice you’re burning, and the perfect combination: engine up front, driven wheels in the rear. Unlike it’s Mazda brethren, the 124 is completely livable in day to day life being more subdued and smooth, but is just as capable in the back roads or canyons; and has the additional practicality of a larger trunk and a more sophisticated look, one that doesn’t scream boy-racer or midlife crisis. Unless you plan on only going to autocross or the track, the real answer is always Fiata. Thanks for indulging me in general and for enduring my attempt to be artsy Oppo, and I hope you at least enjoyed the photos. I promise to have a more straight forward and comprehensive review of the 124 (and ND MX-5) soon. In the meantime, I think I’m going to make a trip back to Palomar, or maybe the Malibu canyons, maybe the roads Matt Farah loves, or all the above. Top down, of course.